FT-IR and FT-Raman spectra of 6-chloro-N-(4-trifluoromethylphenyl)pyrazine-2-carboxamide were recorded and analyzed. Calculations were performed at B3LYP/6-31(6D, 7F) and B3LYP/SDD(6D,10F) levels of theory. The calculated wavenumbers at SDD level agree well with the observed wavenumbers. The data obtained from vibrational wavenumber calculations are used to assign vibrational bands obtained experimentally. The normal modes are assigned by total energy distribution method. The calculated first hyperpolarizability is comparable with reported values of similar derivatives and is an attractive object for future studies of non-linear optics. The geometrical parameters of the title compound are in agreement with the parameters of similar derivatives. The red shift of the N-H stretching wavenumber in the infrared spectrum from the computed wavenumber indicates the weakening of the N-H bond. 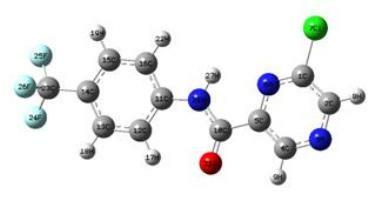 NBO analysis has been performed on the molecule at the SDD level in order to elucidate the intramolecular, rehybridization and delocalization of electron density within the molecule.